I’m shining the spotlight on my friend Rachel again. Rachel is no stranger to fabulous parties, she organizes fun events which look effortless and always filled with delicious goodies. For anyone who feels like it takes too much work or preparation to host a book night or craft night, you will love this post. Hosting these types of mini-parties are very easy and don’t require as much work and planning as a typical party. 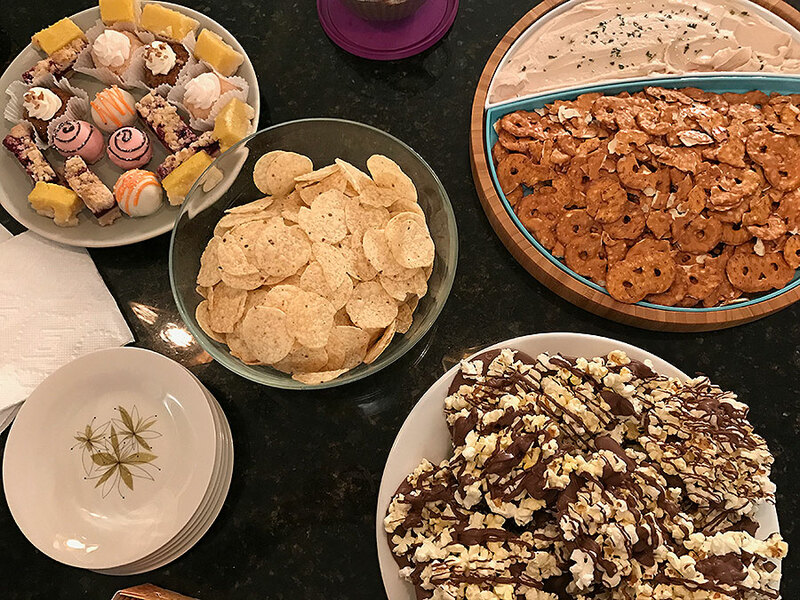 When Rachel decided to throw a craft night, she asked all the guests to bring their favorite snacks. One guest brought a delicious white bean dip with pretzels. Another brought home-made chocolate covered pop-corn… SOOO GOOD… and another brought yummy gourmet chocolates. Rachel did an outstanding job of organizing a night out and creating a fun craft. And since all the guests were more than happy to bring something fun, Rachel also made her life a little easier. This entry was posted on Monday, November 5th, 2018 at 2:15 am	and is filed under Appetizer Platters, Appetizers, Book Club, Parties, Uncategorized.